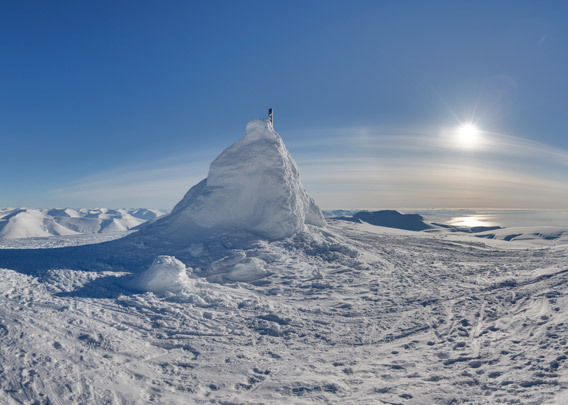 A tour up to the top of Nordenskiöldfjellet, the highest mountain near Longyearbyen with an altitude of 1051 metres. In winter, it is a nice day trip with cross country skis. Some locals take the trip, which is partly quite steep, with snow mobiles, something that is not immensely popular with those who are out on a quiet trip. The reward for the long ascent comes in shape of a great view over large parts of Nordenskiöld Land and Isfjord. 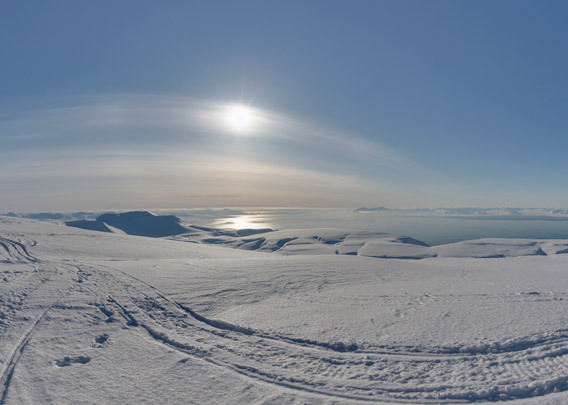 A group of Swedish scientists wintered on Nordenskiöldfjellet during the International Polar Year of 1932-33. This was the highest wintering on Spitsbergen ever and combined with an immense logistical effort. All the equipment including building materials for the hut and all supplies had to be carried up the mountain, which was mainly done by dog sledge. The hut is now used by the Red Cross Longyearbyen. In winter, it is completely covered by snow.